Sophie had been taught by her parents, teachers and society to be a ‘nice girl’. To be polite, treat others well and avoid upsetting anyone. As a result, she received lots of positive feedback from those she was kind to. But Sophie’s self-worth became linked to those compliments and as she reached her mid-30s she realised that her good nature was being taken advantage of. Colleagues would dump work on her, her family expected her to listen to all their problems and she was stuck in a relationship where she felt unappreciated. It was at this point that Sophie started to work with me and we discussed her need to set personal boundaries. To value herself in a way that didn’t rely on other people’s feelings and behaviours towards her. 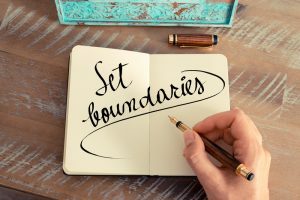 You can set personal boundaries around any area of your life. They could be about your thoughts and feelings, your physical space, your friends and social life and your spiritual beliefs. If you haven’t had a significant adult who role modelled personal boundaries, setting them can feel uncomfortable. Think about the different types of boundaries I’ve listed above. Try to recall situations where you’ve felt discomfort, anger, resentment or frustration with someone. This is usually because one of your limits have been crossed. Identify the boundary that you would need to put in place to avoid these feelings again. For example; you’re not happy to ‘bad mouth’ other friends or you’re not prepared to have your parents every Xmas when your siblings don’t help. Which relationships in your life would this boundary apply to? Friends, colleagues, family, partner or strangers? When you feel someone is about to cross your boundary, speak up assertively. There’s no point in having boundaries if you don’t respect them. Be polite but firm and rather than blaming the other person use ‘I’ statements like; I feel, I need, I don’t, I believe. 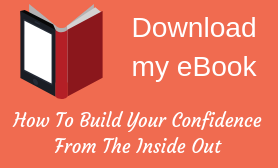 When you’re changing your mindset or behaviour it does take time and practice to embed. I suggest you identify one boundary at a time and challenge yourself to speak up if it gets crossed. Don’t feel guilty though, because respecting yourself is not the same as being selfish. You’ll find that people may be surprised at your new behaviour but will respect you for having boundaries and what a boost it gives to your self-worth!